This is a quick and easy dish – try making enough for a couple of meals and you have filling ready for quesadillas or tacos later in the week. In heavy sauce pan sauce onion in oil until soft and translucent, add garlic and saute for another couple of minutes. Add butter, spices and oregano. Cook and stir just until the butter has melted. Add beer, tomatillos (or salsa verde) and jalapeno pepper. Bring broth back to boil, stir in chicken and turn temperature down to allow chicken to simmer. Cook gently for about 15-20 minutes, just until chicken is cooked through. Remove chicken from liquid, and allow liquid to boil until it has reduced and thickened – about another 10-15 minutes. Remove from heat. When chicken has cooled enough to handle, shred it and return it to the liquid mixture. Absolutely delicious as a taco or quesadilla filling, or served with homemade tortillas, mexican rice and vegetables. 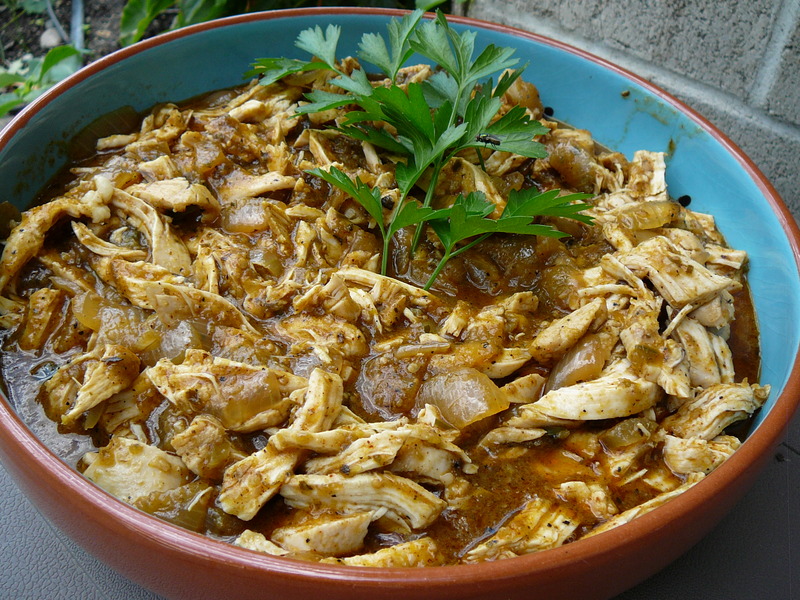 This entry was posted in Chicken, Mexican, Recipes and tagged beer, Chicken, jalapeno pepper, onions, quesadillas, salsa, salsa verde, tacos, tomatillos by Chatty Kathy. Bookmark the permalink.